The Google Play Store is undergoing some changes. One of them includes the official arrival of a feature announced a year and a half ago, which allows you to test applications before actually installing them on Android device. However, now finally Google added this feature to its app store. The Google Play Store is undergoing some changes. One of them includes the official arrival of a feature announced a year and a half ago: Instant Apps. The new feature will allow you to test apps before actually installing them on Android. To do so, on the app page, just click “Test Now” (or “Try it Now”). Basically, developers divide the application into smaller functional pieces and make them available on one page. When the user accesses it, these small samples work right there, albeit partially. If you like, you will have the option to download and install the app via the conventional channels. But there are some important limitations. For starters, the number of applications that Instant Apps supports is still low. Among them are Skyscanner (for the search of hotels and flights), NYTimes Crosswords (crosswords and puzzles) and one of Red Bull TV (with sports content). More apps are expected to gain compatibility, of course. Instructions for developers are available here. Another limitation concerns availability. Instant Apps has been tested for some time and, according to the tech giant Google, it already works on more than 500 million devices. However, the feature still does not appear in all supported accounts (although this should change from now on). To quickly activate (or deactivate) Instant Apps, if your smartphone is compatible, simply go to Android settings, sign in to Google, and enable the Instant Apps option. Recently tested applications will be listed there. 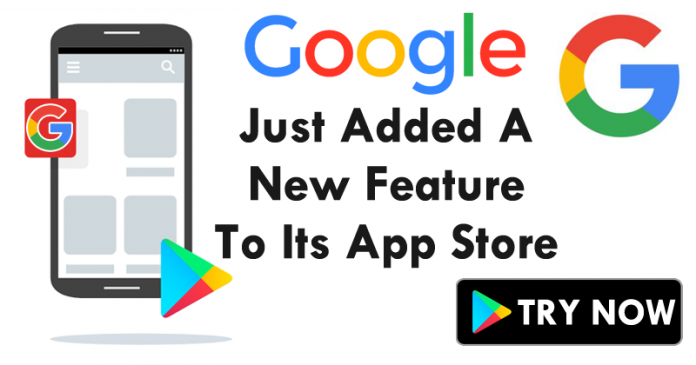 In addition to the “Test Now” button, which begins to appear more often, the Google Play Store is getting a refreshed look, which promises more organization. The news is being released progressively.